Product prices and availability are accurate as of 2019-04-18 00:59:46 UTC and are subject to change. Any price and availability information displayed on http://www.amazon.co.uk/ at the time of purchase will apply to the purchase of this product. Leather. This bag size fits long wallet *Width: 9.5"/24 cm. *Height: 10"/ 25.4 cm. *Depth: 0.75" /1.9 cm. *Strap Drop: 21" / 53 cm (120 cm in total, good length for women who are below 175 cm) Full grain black pebble leather. Fabric Lining. Zipper Closure, zipper puller as the first model shows. 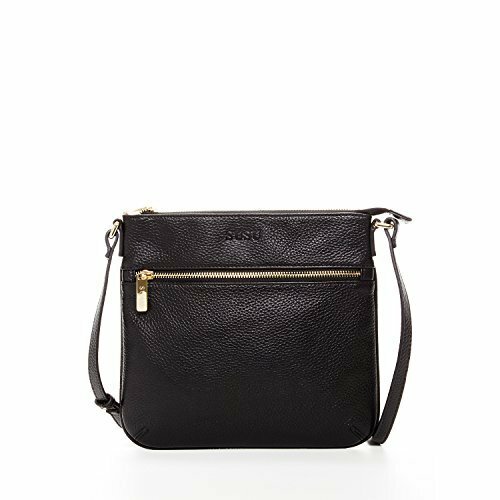 Interior Zip Pocket Cell Phone Slot A small leather crossbody bag, the black handbag purse Saxon is the ideal leather bag for the woman who needs a simple yet stylish handbag for everyday wear. Crafted from genuine pebbled leather,this black crossbody purse features a functional pocket with horizontal zipper closure on its front while its back is adorned by a slip pocket for easy access. Its interior is cotton-lined with a top zipper closure. The bag comes with an adjustable crossbody strap. This flat crossbody bag is available in black, red, brown, and beige.